What will employees expect from their workplace by 2025 and what will be FMs’ biggest challenge in managing them? 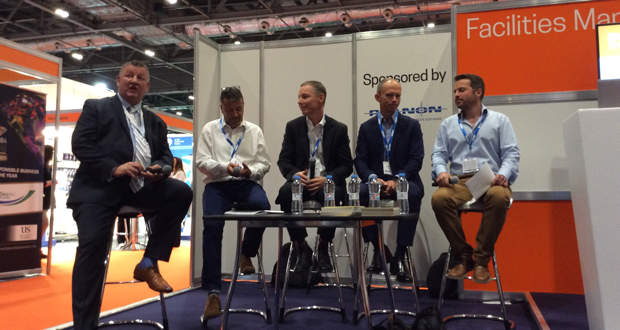 This was the topic for discussion at the FMJ debate held on the first day of the show; which concluded that every organisation is different and while most will embrace the latest tech trends and agile working, they need to do this at their own pace. The panel debate, chaired by Adam Burtt-Jones, Co-founder Burtt-Jones & Brewer, comprising Alistair Craig, Managing Director at Anabas, Dr Andy Lewry, Principal Technical Consultant BRE, Adrian Powell, Director Active FM and Ian Wade Head of UK Estates for the British Medical Association, had a fascinating dialogue on the sorts of challenges to come over the next seven years. The panel concluded that flexibility is demanded already by people walking into a space meaning FMs are on that journey already, with tech as an enabler. Culture is critical – It was agreed that culture is absolutely fundamental to how an organisation uses space, which is why FMs, designers and other stakeholders, including HR and IT must take the time to understand that identifying the culture of the workplace is vital before you make any changes, as one kind of cookie cutter environment doesn’t work for every organisation.